A memorial service was held for those killed at Antietam by Chaplain Stevens on Sunday, September 21. The next day, just after daybreak, the men of the Fourteenth Connecticut marched up Smoketown Road, past the shot-scarred Dunker Church and into Sharpsburg. It was common for infantry regiments to have a band, and the Fourteenth seemed to have quite a fine one. As they left the grim specters of battle behind, the band struck up some good marching music, the spirits of the men were raised, and the southward march toward Harper’s Ferry seems to have been an enjoyable one. In high spirits they waded across the Potomac and into the town made famous by the abolitionist John Brown. Then it was a steep uphill march to the Heights of Bolivar just south of Harper’s Ferry. Bodies of the Federal garrison that had been routed by Lee’s men the week before lay unburied. The men of the Fourteenth, who had been spared burial detail at Antietam, now engaged in that grisly task as they set up camp within the fortifications that would be their home for the next six weeks. Fiction Connection: The high-spirited march and crossing of the Potomac made me ask myself, “What if…?” And the introduction of the cornet player in An Eye for Glory was the result. This entry was posted in 1862, Antietam Campaign, Life in Camp, Men of the 14th on September 21, 2012 by admin. 150 YEARS AGO TODAY at 2 a.m. the men of the Fourteenth Connecticut rose quietly from their bivouac near Antietam Creek at 2 a.m. Ammunition was issued and the men assembled with the rest French’s Division of the Second Corps to march toward the sound of heavy fighting that began at dawn. They forded the creek and entered the East Woods where the terribly bloody price that day would extract from both armies was already being told in the countless wounded men who sought refuge under the canopy of trees, and the untold hundreds that lay lifeless in the fields just beyond the woods. French’s Division marched out of the woods to the south, Gen. Weber’s Brigade first, then Col. Morris’ Brigade, followed by Gen. Kimball’s Brigade. The regiments in Morris’ Brigade were left to right: 108th NY, 130th PA, 14th CT. They followed Weber’s men down into a shallow swale, past the Mumma and Roulette farms, then up the slope to the north of the lane to the Roulette farm. \n\nThe men of Webb”s Brigade were the first to assault the heavily defended Confederates in the sunken farm road that would become known as the “Bloody Lane.” The men of the 14th CT saw the men of the men of the 1st DE and 5th MD cut down before their eyes, and when these men rushed back up the slope, they caused some of the men from Connecticut to break for the rear as well. Then Morris’ Brigade advanced, but they remained farther from the sunken road than did Weber’s men. They were ordered to maintain fire upon the enemy, which they did until Kimball’s Brigade came up to relieve them. The banner photo at the top of this page shows the bend in the Bloody Lane where the men fought. The 14th CT was ordered to take up position in a farm lane (I believe it was Roulette’s). 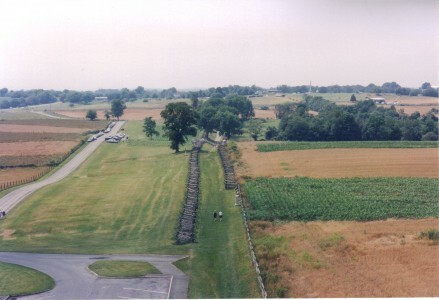 Here they watched the Division of Gen. Richardson, including the Irish Brigade drive up over the crest of the hill in front of them and out of sight toward the sunken road. And they also saw how greatly the numbers of the Irish had been reduced when that brigade withdrew. Bloody Lane: 14th CT was at lower right when fighting ended Sept. 17. But then there was a breakthrough at the sunken road and the men of the Fourteenth were going forward again. They were attached to Richardson”s Division to help position and defend a battery of artillery. This was when Gen. Richardson was mortally wounded by a shell fragment. The 14th CT ended its first day in battle positioned between Gen. Meagher’s Irish Brigade and Gen. Caldwell’s Brigade in the newly established Federal line along the eastern side of the Bloody Lane. The division was now under the command of Gen. Winfield S. Hancock. The Fourteenth Connecticut suffered a fifteen percent loss at Antietam. Killed: 2 company captains, 19 enlisted men. Wounded: 2 officers, 86 enlisted men. Missing: 28 enlisted men. Fiction Connection: Antietam is Michael G. Palmer’s first test as a soldier, and while he emerges unhurt, his worth as a soldier remains uncertain. This entry was posted in 1862, Antietam Campaign, Battles of the 14th on September 17, 2012 by admin. 150 YEARS AGO TODAY part of the Army of Northern Virginia took up positions on South Mountain, an extension of the Blue Ridge Mountains north of the Potomac between Frederick and Hagerstown, Maryland. Their job was to delay the advance of the Army of the Potomac until the rest of Lee”s split army could assemble for battle. That Sunday, Federals advanced up the slope toward the Confederates. Heavy fighting raged at three gaps, Crampton’s, Turner’s, and Fox’s, from mid-morning until failing daylight and mounting casualties forced Gen. Lee to withdraw toward Sharpsburg. The men of the Fourteenth Connecticut were spectators along with the rest of the Second Corp. They spent that hot afternoon marching up the National Road toward the mountain ridge that was wreathed in battle-smoke. They crested the mountain at Turner’s Gap well after dark, and worn and weary from the hot, dusty march, they were forced to lay out their rubber blankets and bed down for the night among the corpses from the day’s fighting. The next morning they marched down the western slope of South Mountain to Boonsboro, where they turned southward toward the town of Sharpsburg and a creek called the Antietam. Fiction Connection: The first scene in my novel An Eye for Glory is when the men of the 14th CT arrive atop South Mountain late at night and are confronted by the grim realities of a Civil War battlefield. This entry was posted in 1862, Antietam Campaign on September 14, 2012 by admin. One hundred and fifty years ago today, when the untested and hastily trained men of the Fourteenth Connecticut set foot upon Chain Bridge to cross the Potomac into Maryland, they knew their mission was to pursue the Rebel forces under Gen. Robert E. Lee, and probably fight their first battle. But death would not wait for them to close with the Confederate Army. The very next day near Rockville, MD, James McVay, an older soldier in Company K, died of heat exhaustion. Two of his sons also marched in the same company, and both would serve faithfully, without major injury, until the end of the war. On September 11, they passed through Clarksburg, MD, and camped on the same ground Lee”s men had occupied just two nights before. As they marched on the signs of their foe grew more numerous and more sobering—homes burned and ruined, crop fields looted and trampled, broken down military equipment, dead and unburied horses and mules. As the men encamped that evening just west of Frederick, they may have seen the sun set behind the Blue Ridge, which in Maryland north of the Potomac was known as South Mountain. But what they couldn’t see or know as they closed their eyes in exhausted sleep was that Gen. Lee had devised a hot reception for the boys in blue atop that ridge. This entry was posted in 1862, Antietam Campaign, Men of the 14th on September 7, 2012 by admin. We left the boys of the Fourteenth Connecticut late in the day on August 30, 1862, when they arrived at Fort Ethan Allen. A quick search on Google Earth (Fort Ethan Allen Park, Arlington, VA) will show you the precise location of the fort, several miles northwest of Washington near the Potomac River. The 14th Connecticut was joined with two other brand new regiments, the 108th New York and the 130th Pennsylvania, to form a new brigade, under the command of Col. Dwight Morris of the 14th Connecticut, who was the senior ranking officer in the brigade. The brigade became the Second Brigade of the Third Division (Brig. Gen. William H. French commanding), of the Second Corps (Maj. Gen. Edwin V. Sumner commanding), of the Army of the Potomac (Maj. Gen. George B. McClellan commanding). The Fourteenth spent eight days at Fort Ethan Allen, departing on Sunday, September 7. Some manual of arms drill must have occurred during that time, but I have not found solid evidence of it. The writings of Hirst and Fiske, and other sources quoted in Page’s history, make no mention of training with the new rifles. A prevalent attitude during the early part of the war was that individual marksmanship mattered little, it was the volume of fire that counted most. This was standard strategy during the age of smoothbore muskets. As these men would prove just ten days after leaving Fort Ethan Allen at Antietam’s sunken lane, they would maintain their formations, and maneuver and march under fire. But would they be able to shoot straight? This entry was posted in 1862, Antietam Campaign, Men of the 14th, Recruitment & Training on August 31, 2012 by admin. Perhaps you noted the date on which the untried men of the Fourteenth Connecticut first set foot in Virginia, August 29, 1862, the same day the Second Battle of Bull Run (Manassas) raged just thirty miles away. So, what happened to our boys from the Nutmeg State? The men crossed the Potomac on Long Bridge, which stood where the current Amtrak bridge is just north of Reagan International Airport. It was originally designed as a railroad bridge, but it was not strong enough to bear heavy locomotives. It was also narrow, and traffic could only move in one direction at a time. A long mule train had just started to cross from Alexandria when the men of the Fourteenth arrived at the eastern end of the bridge. There was nothing for them to do but wait for each of the wagons to pass. Wagons of their own loaded with crates of brand new rifles awaited the men when they stepped off Long Bridge, but only A and B Companies were issued their Sharps rifles. Then the regiment marched southeast about a mile and camped for the night on Arlington Heights near what was then Fort Richardson. A long, loud drum roll awoke the men before dawn on Saturday, August 30. It spoke of imminent danger. News of the fighting at Bull Run filtered down through the ranks. They might be attacked at any time. The crates from the Springfield Armory were hastily pried open and the rest of the men finally received their weapons. Every man was issued forty rounds of ammunition, but no training in loading and firing the rifles was given. There was no time. The men were ordered to leave their knapsacks, warm woolen blankets, shelter tents and overcoats to ward off the cold and rain with the quartermaster, with the assurance that their possessions would be returned when they had need of them. Then, with only two hardtack crackers and a few swallows of tepid water for a day’s rations, the regiment set out on their first forced march to Fort Ethan Allen, a distance of about ten miles. And when they stumbled into the fort later that afternoon, they were immediately caught up in the swirling tempest caused by the Union disaster at Bull Run. Their army was in full retreat. What could a few untrained new recruits from Connecticut do? This entry was posted in 1862, Antietam Campaign, Recruitment & Training on August 24, 2012 by admin. After the review, the regiment marched past the capitol building, then down toward the Potomac and the enemy soil of Virginia. This entry was posted in 1862, Antietam Campaign, Men of the 14th on August 17, 2012 by admin.